Performance wear and stretchy fabrics can be challenging for embroiderers to achieve smooth,crisp embroidery designs. 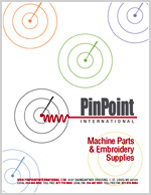 PinPoint's Woven Backing will simplify the process and help you to achieve great results! This medium weight backing is a true woven cutaway. The tight weave provides for excellent stitch definition and detail on delicate or thin stretchy fabrics. Especially suited for moisture wicking performance wear products, polos, infant and children apparel. Combine with Tearaway Backing when using heavy or dense stitch count designs. Available in die-cut sheets of 500 or 1000 packs.